For college courses in Writing Across the Curriculum (Composition) and Research Writing (Composition). 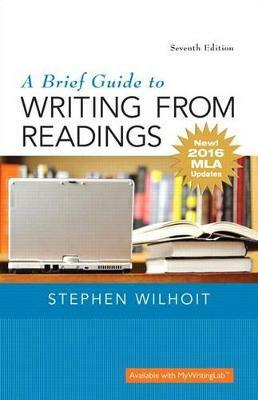 A Brief Guide to Writing from Readings is a clear, process-oriented guide to academic writing. The guide covers the subtleties of rhetorical analysis and argumentation strategies as well as the technical aspects of writing with sources. Students will learn first to examine texts critically and then to clearly, accurately and creatively respond in essay form. In-text tools including summary charts and revision checklists help students tackle source-based essays step by step. Instructors will rely on the guide as a one-stop reference tool; students can apply their learning to any discipline, whether for class work or independent study. In the Seventh Edition, in response to student and faculty feedback, Wilhoit includes a new chapter on analyzing readings and composing analytical essays; more coverage of literary analysis and a new short story; eight academic readings; and expanded coverage of how to cite electronic sources in APA and MLA style.